Wendi Zwaduk - Romance to make your heart race: Argh! More Waiting! I got a ray of good news, but I can't share it. I got a great story working, but I can't seem to get time to work on it. I have at least 6 ebooks waiting for my review, and there isn't enough hours in the day. I guess it comes down to patience - which I am sorely lacking - and the desire to succeed. I want to make things happen so bad and it drives me nuts when I can't control things (or at least give gentle nudges to get the ball rolling). I'm by no means a control freak. I actually am rather laid back, but when I have things I really need to get done and can't get to because of others... well, it drives me crazy. And no, this isn't a blast on anyone other than me. I feel bad for my crit partner. No matter how hard she tries, her computers aggravate her and break. Another one is simply not writing at all. She lost the drive [along with her job - poor baby : ( ] and can't seem to get the magic back. So it would appear I need to stop blogging for today and get back to the reviews and the WIP. Here's some eye candy to tide everyone (mostly me) over until later. 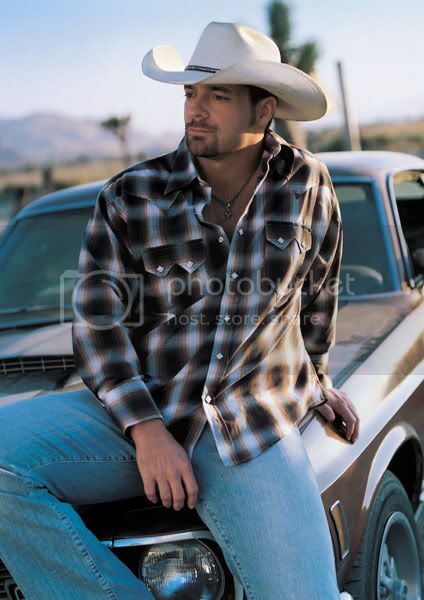 He's Chris Cagle and one of my favorite country music singers. When he sang "The chicks dig it" he had to be talking about himself! Yummy! Although, I think Laredo is my favorite song of his. Check him out while I slink back into my bat cave. Write a short! - I did! My turn... I've got a cold.